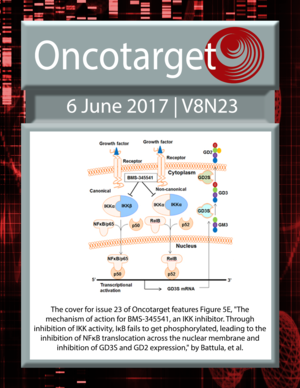 The cover for issue 23 of Oncotarget features Figure 5E, "The mechanism of action for BMS-345541, an IKK inhibitor. 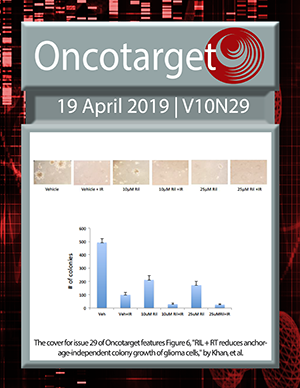 Through inhibition of IKK activity, IκB fails to get phosphorylated, leading to the inhibition of NFκB translocation across the nuclear membrane and inhibition of GD3S and GD2 expression," by Battula, et al. Are pretreatment neutrophil-lymphocyte ratio and platelet-lymphocyte ratio useful in predicting the outcomes of patients with small-cell lung cancer?